HELENA, Mont. 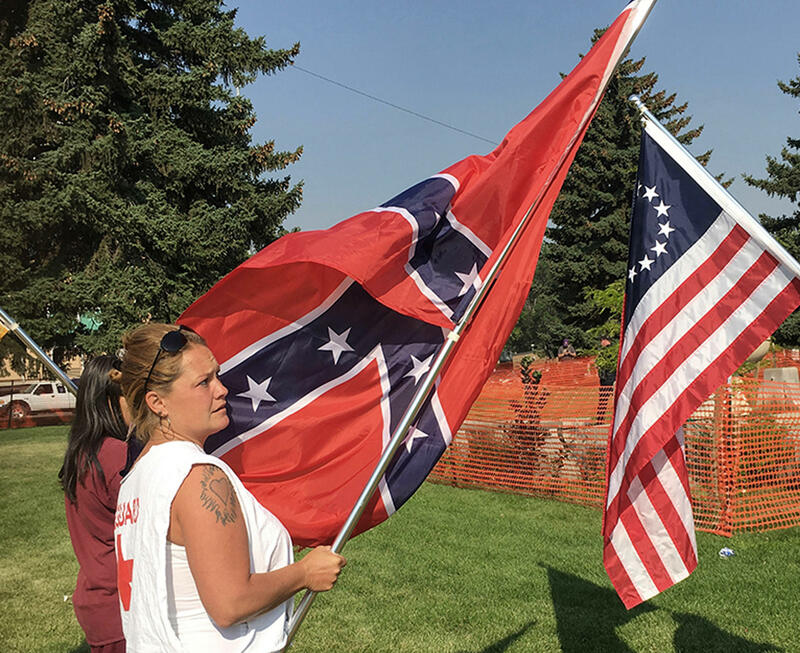 -- Montana's capital city on Friday removed a memorial to Confederate soldiers that has been in a public park since 1916 after officials deemed it a threat to public safety in light of last weekend's violence in Charlottesville, Virginia. A small group of people opposing the fountain's removal in Helena had stood watch through the night. About 20 people gathered to protest Friday, CBS affiliate KXLH reports. Police said two people were arrested, but later released, after defying orders to leave the site while crews began dismantling the granite fountain donated to the city more than a century ago by the United Daughters of the Confederacy. One of the women arrested told KXLH the fountain is a "beautiful piece of art." "It was not given to the city, it was given to the citizens of the city," Patricia Sorenson told KXLH. "We're just trying to preserve this monument," said Tony Crew, 28, who stood by with a huge American flag as city crews fenced off the fountain. "It's part of our history, and we don't need to follow the precedent of the rest of the country." Calls for removing the fountain in Helena's Hill Park - and other Confederacy-related monuments across the country - increased after last weekend's deadly confrontations at a white nationalist rally in Charlottesville. Earlier this week, Native American lawmakers in Montana sent a letter to the city requesting that it remove the fountain, which they said stood for segregation, secession and slavery. The memorial is thought to be the only Confederate monument in the upper Rockies. The Helena City Commission agreed on Wednesday and acted swiftly to uproot the fountain from the park just two blocks from City Hall. Crews arrived shortly after 9 a.m. Friday. By early afternoon, it was lifted by crane onto a flatbed truck. City Parks and Recreation Director Amy Teegarden said the fountain initially will be stored in a city warehouse. "Our intention is to remove it in such a way that the fountain, and its pieces, can remain intact and be reassembled at a future date," Teegarden said. Confederate monuments coming down across the U.S.
About 50 people, not all of them protesting the removal, gathered at the scene as a handful of police officers stood watch. Angela Smith was visiting with her husband from Spokane, Washington and said she was a descendent of Union soldiers. Smith said it was time for such monuments across the country to come down. "Do we have statues of Hitler? Do we need things like that to remember our history?" she asked. One man, who declined to give his name, said the fountain was not a symbol of racism or hate but is part of American history that should not be forgotten. "Somebody has to make a stand," he shouted as city crews erected two rings of orange plastic fencing. Tiffany Ivers, who was born in Texas but has lived most of her life in Helena, arrived with a Confederate flag. "Taking down a monument that has nothing to do with what's going on is not OK," Ivers said.